Back from Dubai, Gun Runner wasted no time announcing—shouting—his return to the United States. In his first start since he finished second to Arrogate in the March 25 Dubai World Cup Sponsored by Emirates Airline (G1), Winchell Thoroughbreds and Three Chimneys Farm’s Gun Runner drew off in the stretch for a seven-length victory in the $500,000 Stephen Foster Handicap (G1) under the lights June 17 at Churchill Downs. In 26 editions of the Stephen Foster, no horse has won the race by a wider margin. That record could have been even wider, had winning rider Florent Geroux not allowed the 4-year-old son of Candy Ride to coast to the wire late before a crowd of 20,669. Winning trainer Steve Asmussen, who saddled a 4-year-old Curlin to a 4 1/4-length victory in the 2008 Stephen Foster following his Dubai World Cup win, thanked the owners for bringing back Gun Runner for his 4-year-old season. 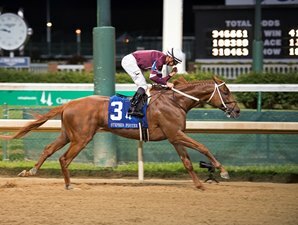 Gun Runner closed out his sophomore year with his first grade 1 victory in the Clark Handicap at Churchill in November and has continued to progress this season. His victory Saturday pushed his earnings past $4.6 million. The 1-2 favorite had no problems as the 124-pound highweight. With early runners Bird Song and Stanford not especially aggressive after the gate opened, Geroux opted to send Gun Runner to the front and he quickly settled into a beautiful stride, polished off a quarter-mile in :23.59, and opened up two lengths on his rivals through a half-mile in :47:23, with Stanford in pursuit. About three-quarters of the way through the far turn, the only serious challenge for the winner came when Stanford was asked for his best by John Velazquez. But that challenge only prompted Gun Runner to flash better. He quickly drew off to a five-length advantage and coasted home as Geroux geared him down in the final sixteenth. Gun Runner returned $3, $2.40, and $2.10 across the board while DARRS’ Honorable Duty paid $4 and $2.60. Breaking Lucky paid $3. Honorable Duty earned his first grade 1 placing for trainer Brendan Walsh. Gun Runner is out of grade 2-winning Giant’s Causeway mare Quiet Giant, who is a half sister to the late champion and 2005 Stephen Foster winner Saint Liam. The Stephen Foster is a Breeders’ Cup Challenge “Win and You’re In” race for the Breeders’ Cup Classic (G1).